Mommy Maestra: Happy Kid Inventors' Day! 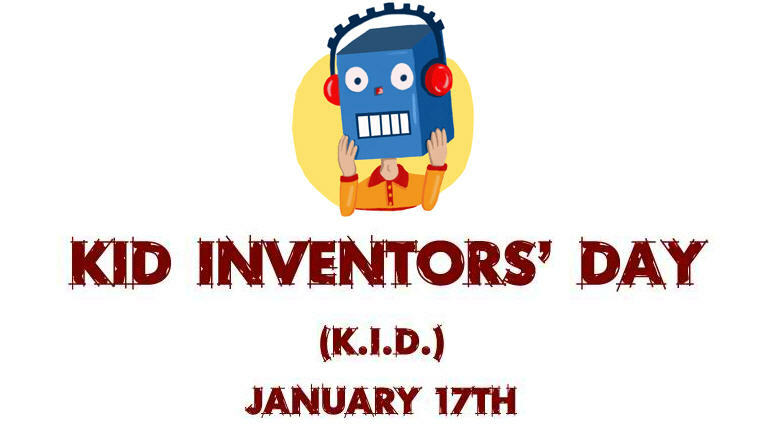 Did you know that today is Kid Inventors' Day? It's celebrated every year on January 17th in honor of one of our country's greatest inventors: Benjamin Franklin. He was born 307 years ago today. We studied Franklin last year and the kids had a blast learning about all of his inventions: the lightning rod, the Franklin stove, bifocals, the flexible urinary catheter (yikes! ), the odometer. And at the ripe young age of 12, he invented swim paddles (flippers). He also discovered many fascinating things about electricity, including how to store it in a crude battery of sorts. People who invent things fascinate me. More often than not, they invent more than one thing. Some would say that few people are born true inventors. I would argue that everyone is born with that natural curiosity and creativity that are the parents of invention. But instead of encouraging our children and students, we tend to discourage it. How often do your kids create elaborate mazes or machines out of ordinary household items? How often do you compliment your child when they do...or are you like me, sometimes fussing about the mess they've made? Instead, why don't we make it a regular habit to encourage their spirit of invention? Today, I'm setting aside some time this afternoon for my kids to create something. Whatever they want. And to inspire them, we'll explore the Kid Inventors' Day website. To make things fun, we'll be putting together an Inventor's Kit that includes (among other things) an Inventor's Journal, tape, glue, pipe cleaners, paper clips, brads, popsicle sticks, yarn, magnets, and anything else my children happen to think of. I'll post a picture when they're finished with it. Narcis Monturiol - Spanish inventor of the first submarine. Ellen Ochoa - Invented optical analysis systems (and was the 1st Latina astronaut). Victor Ochoa - The Mexican American Inventor of the Ochoaplane, and a windmill, magnetic brakes, a wrench, and a reversible motor. Ileana Sánchez - Puerto Rican inventor of a book for the blind that brings together art and braille. Guillermo González Camarena - The Mexican inventor of the first color tv. Ronald "Ron" Rivera - Puerto Rican. Invented an inexpensive ceramic water filter used to treat gray water in impoverished communities. Jose Hernandez-Rebollar - Invented the Acceleglove, a glove that can translate sign language into speech.